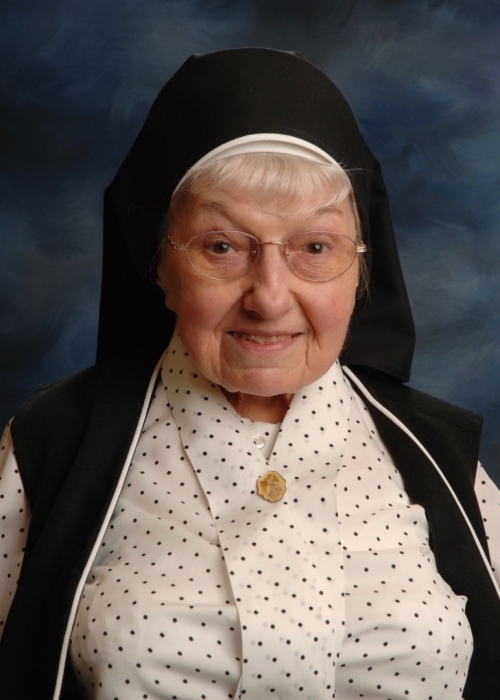 Sister Audrey Drap, a Sister of Charity of Nazareth was called to her heavenly home on Friday, April 13, 2018, at the age of 93 and in the 75th year of her religious life. Sister entered the Congregation of the Vincentian Sisters of Charity from St. John the Baptist Parish in Unity, PA in 1943. She received her B.Ed. degree from Duquesne University and an MBA degree from Notre Dame University and served the Church as an elementary and high school teacher for 29 years in the Dioceses of Pittsburgh and Greensburg, PA and Mobile, AL. In 1975 she was elected Treasurer of the Vincentian Sisters of Charity, a position that she held for 8 years. Sister Audrey was then assigned to work in the Accounting office of Vincentian Regency Nursing Home where she managed the finances for 14 years and later became an aide in the Adult Day Care Center. She retired from Vincentian Regency in 2007. All who knew Sister Audrey were aware that she was an avid sports fan. Those who watched or listened to a baseball, football or hockey game with Sister Audrey would be educated in all the details of that sport. She was particularly fond of hockey since her grandnephew was a hockey player. Sister Audrey was preceded in death by her parents Paul and Anna Drap, her brothers John, Paul, Anthony, and Rev. Cyril and sisters Margaret and Annie “Honey”. She is survived by her sisters Mary Kulick and Cecilia Liko, nieces and nephews, and her Sisters in Community. Friends will be received at St. Louise Convent, 8200 McKnight Road, Pittsburgh, PA on Wednesday, April 18 from 2:00 to 8:00 p.m. with a Wake Service at 6:00 p.m., The Mass of Christian Burial will be offered in the convent chapel on Thursday, April 19 at 11:00 a.m. preceded by a time of visitation from 9:00 to 10:30 a.m. Internment will take place following the Mass in the Sister’s cemetery on the convent grounds. Sister Audrey was my 3rd Grade teacher, 1955. The best of teachers: kind, compassionate, gentle, great listener…. I often visited her at St. Louise. Sister Audrey will be greatly missed.